The idea I had in mind for this editorial was to shoot mainly outdoors with a mix of studio. 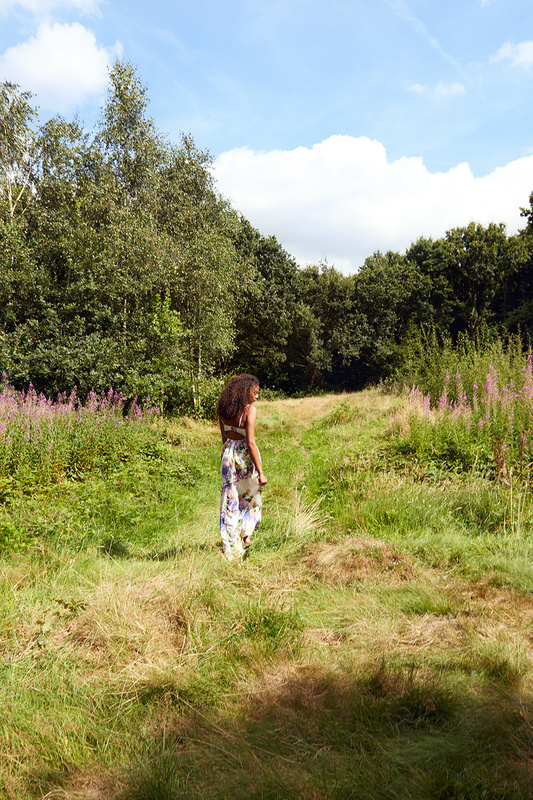 I wanted this shoot to have a natural effortless feel and so I set out to find a suitable outdoor location. Along with Georgina I ventured into a large country park that we knew well, this time we went deeper in than we had before and I'm glad we did as we came across some great locations, the problem was that it was a very overcast day when scouting, it even began to rain heavily just before we found the last location. Happy with the locations we found I began looking for our model. Usually it can take me days when trying to find the right model for a shoot but after only a few hours of searching I came across Tiana. Tiana was tall, beautiful and had lovely natural curly hair, she was perfect for what I had in mind. I reached out to her and thankfully she was interested in working with me on this shoot. With my model secured, I booked a studio not far from the outdoor location so that we wouldn't have too much travelling time between both. Georgina then began deciding on makeup ideas and looking at outfits for the shoot, she managed to find outfits that suited the natural warm feel I was going for which was great. The next tricky part came when deciding how I was going to tie the studio images together with the outdoor ones. I came across a green background paper which at first I was hesitant about using as I felt it might be too on the nose but in the end I decided to go for it. On the day of the shoot we got into the studio, I put on some music and Georgina got to work on the hair & makeup. I began shooting the first look and I’m happy to say the green paper worked out great, it was a very light green which became even brighter when the strobes hit it and so it was perfect for what I wanted. For these shots I used a two light setup, I used a large octabank with diffuser, high up, angled down and off camera right for a soft wash of light over Tiana and I used a small gridded beauty dish behind Tiana for a harder rim light. The studio also had an infinity cove so without having to waste time changing papers it was nice to get some seamless shots as well. After a few more outfit changes it was a wrap at the studio, so we loaded back up the cars and set off. As we drove the sun came out in full force and I was very excited to get shooting. We reached the location in good time and began carrying the equipment to the first location. The outfits Georgina had chosen for this setup worked beautifully along with the sunlight which enhanced the scene. Next was the lake shot which I was very excited about, Tiana was a trooper and got straight in, I'll admit I was more reluctant to wade into the water but once in we began shooting and I loved every minute of it. Lastly we moved onto the final setup of the day which was to be the tree shots, I loved the look of this tree the first time I saw it and I was happy to see it looked even nicer with streaks of sunlight running through it. The clouds had begun to move over head blocking out the sun for minutes at a time and so I used the extra time to get my lighting where I wanted it, then as the sun peaked through the clouds all there was for me to do was measure for the ambient light and adjust my strobe settings accordingly. From the previews alone I could see the images were looking great, Tiana moved really well, changing after each shot, the only time I had to stop was whenever the sun would disappear behind the clouds again. This shot was a simple setup, I used a large octabank just behind me, off camera left as my main light and I used the sun behind my subject as my backlight, the rest was just balancing the two for the exposure I wanted. Lastly I had recently seen Tarzan in the cinemas and really loved a scene where Margot Robbie and Alexander Skarsgård were in a tree in formal clothing it was a nice mix of everyday wear (in the 1800's) and nature. Although we weren't in a jungle... or the 1800's I still liked the idea and so I asked Tiana if she wouldn't mind climbing onto the tree and just like the lake before I had even finished my sentence she was already half way up! The sun filtering through the trees was creating some lovely light streaks and I wanted to keep those in the shot and so I moved my octabank far away from my subject directly in the direction of the sun and put it on a low power setting to just help give the light that was already there a little kick. This was another fantastic shoot and we came away with some fantastic images. A big thank you to Tiana for being so open to ideas and easy to work with and as always a big thank you to Georgina for not only the hair & makeup but also her assistance on this shoot.